Tonight on NBC our favorite reality show THE VOICE returns for its fifth season. This season CeeLo and Xtina are reunited with Blake, Adam and Carson in an all-new quest to find the best new singer in America, while Carson Daly continues to serve as host. Tonight the blind auditions comment, during the blind auditions, the decisions from the musician coaches are based solely on voice and not on looks. The coaches hear the artists perform, but they don’t get to see them — thanks to rotating chairs. If a coach is impressed by the artist’s voice, he/she pushes a button to select the artist for his/her team. At this point, the coach’s chair will swivel so that he/she can face the artist he/she has selected. If more than one coach pushes his/her button, the power then shifts to the artists to choose which coach they want to work with. If no coach pushes his/her button, the artist is eliminated from the competition. Tonight’s The Voice “The Blind Auditions Premiere” is going to be an exciting one, which you won’t want to miss. 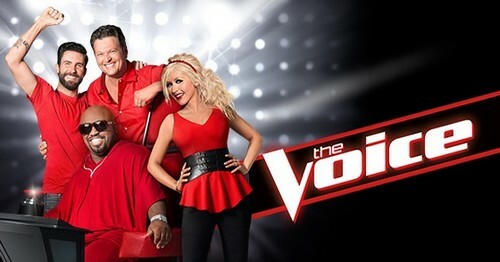 So be sure to tune in for our live coverage of NBC’s The Voice – tonight at 9PM EST! While you wait for our recap, hit the comments and let us know how excited you are about the new season of The Voice. Check out the sneak peek of tonight’s episode below! RECAP: Christina, CeeLo, Blake and Adam kick off the show with a rendition of “I Love Rock Roll”. CeeLo, Christina and Blake all turn around but Adam still sits with his back turned. The crowd is cheering a lot and Adam said he did not expect her raspy voice but loved it, CeeLo says it was so fresh and raw; she set him on fire and wants her. Christina says she loves the fact that she didn’t have to turn around to know she was having a good time singing. Blake starts saying that she should join his team and to teach him about David Bowie and Queen, CeeLo say he will fight for her. Kat then chooses CeeLo Green as her coach; CeeLo takes his walk of victory and hugs her. Next to audition is 17 year old Caroline Pennell, she has always been shy around everyone and has always made singing private because she was nervouse to do it in front of people. She was so nervous the first time performing but when she got on stage it was life changing; she is intimidated and doubts her self a bit but believes it’s the push she needs. Caroline is singing “Anything Could Happen”. CeeLo Green turns around and so does Blake. Adam calls her the sweetest thing on Earth and the giggled when they turned their chairs and Christina loved it a lot; Blake says he voice is so relaxed and it easily flows out. CeeLo says it’s a tone that really works with him; Blake says she has to believe in herself and that she is a badass vocalist. Caroline picks CeeLo Green; he now has gotten the first two audition of tonight. Next up is Donna Allen who is 54, she gave up on an opprotunity in the past because of having her son; she really hopes The Voice can really make her dreams come true that she has waited for 25 years. Donna is singing “You Are So Beautiful”. Christina turns around right away, Adam hits it right after following her. Christina says she is so beautiful and her voice is like the heavens opening up, Blake says that she should pick Christina and Adam is telling him to shut up. Christina says she can’t wait to see where she goes but wants her to have her journey with her; CeeLo interrupts Adam and says it wasn’t what he was looking for but loved it. Adam says that it’s shame on Blake and CeeLo for not turning; he says it felt like he was at the end of the season and will be bummed if she doesn’t pick him. Donna chooses Adam as her coach, Adam gets up does push ups and then gives her a massive hug by lifting her up from the floor. Adam says he doesn’t care about her age, he loves her voice so much. The next contestant tonight is Jake Worthington who’s 17 from Texas; he’s your average country boy and all his friends love his singing and pushed him to go on the Voice. He never performed on a stage this big or in front of a huge audience, he’s nervous but it’s a life time deal and has to do it no matter what. Jake is singing “Keep Your Hands To Yourself”. Nobody turns around for Jake and then Blake thought he’d beat him up, Jake says no and was glad to just be there. Jake says he’s just glad to meet them and Blake says he really screwed up for not hitting the button; Christina says she loved his melody. Jake asks about how to get better, Blake says it was only losing his breath but other than that he’s great. Jake shakes all their hands and then leaves happy and says he respects them all. Next up is Mathew Schuler and he played Rugby at his University, he works and writes songs to remember the sandwiches he has to make. His dad is his biggest role model; he works three jobs to make sure his family lives a comfortable life. Mathew decided to audition because he has so many songs in his heart and wants to share them with the world; it would be an honor for him to be with any of the coaches. Matthew is singing “Cough Syrup” and all the judges turn around in a split second as he starts singing. The judges give Matthew a standing ovation and the whole audience joins in; Blake goes up and tells him he was awesome; Christina even gives him a hug and begs for him to pick her. They are all wanting him on their team and Blake says his wife would love if he picked him; CeeLo says his voice is beautiful and tells him to ask himself to be part of a team or an owner of one. Adam says that they all turned around right away and loved seeing his joy and passion singing. Adam says he knows for a fact they can win it together and believes he has to get him; Christina says he has a great sales pitch and she wants to take it home. Matthew chooses Christina as his coach; she gets up and gives him a hug and is so shocked he chose her. Next up is Nic Hawk who is 26 and has always been into music to express himself; he’s done over 24 musicals. He got a call from his mom and his step dad just left them one night; so he moved back to his family to help them and picked two jobs as a dance instructor and in a bar. It’s now his chance to get back into doing what he loves in his life; being able to perform now is blowing his mind. Nic sings “Hit ‘Em up Style” Adam turns around right away and so does CeeLo. Nic calls Adam handsome and he tells him the same; Adam tells him he turned around because he’s an amazing singer and had very good timing. CeeLo says that Beyonce mastered that R&B style a long time ago and is impressed Nic did it so well; Nic says he doesn’t know if he’ll be able to focus with Adam since he’s so good looking. Nic chooses Adam; Adam gets up and gives Nic a big hug and is happy to have him on his team. Next we see a complication of younger contestants not getting any of the judges to turn around and basically not having what they were looking for. Next up though is 15 year old is Mathew Brea who is originally from Haiti; his dad had an acapela group that got him inspired to sing. His brother died at a very young age and music has helped him heal; at the funeral has sang his brothers favorite song and really misses him. He believes his brother is with him on every performance, he feels anxious and would love to work with any of the coaches. Matthew is singing “I Want You Back”. Sadly none of the coaches turned for Matthew and CeeLo is shocked he is only 15 and calls him a child prodigy; shocked by his voice. Christina asks him for a hug and says she has a lot of respect for him; Matthew mentions his younger brother passing having made him focus on singing more. He promises Adam that he will come back and audition again, Christina has him sit with her and hugs him again feeling so bad seeing him go. Next up is Shelbie Z from Alabama and she is a hair stylist and is really big on pageants; but music means more to her then life. She stopped doing pageants because kids told her she wasn’t pretty when she was young; but she is ready to go on stage and sing. Shelbie is singing “Here For The Party”. Christina, Adam and Blake turn around instantly hearing her strong voice. Blake says he welcomes her to team Blake and cant believe how great she is; CeeLo says she is cute and Adam says her boots are amazing. Christina says she believes that Blake will be chosen as her coach; Adam says to pick anyone but Blake. Shelbie goes and chooses Blake as her coach. Blake, Christina and Adam turn around for Josh. Adam says he sounds exactly like the man who sings the song and it’s amazing, Christina loves the song and loved his vocals. Blake says it believed it reminded him of some of Christina’s vocals and has a man crush on him. Christina says she would love to work with him; Blake goes over and hugs Adam. Josh chooses Christina to be his coach. Nobody turns around for Delvin and CeeLo says he has a very strong vocal and compliments his awesome hairstyle. Adam says he has to come back because he’s very good and deserves another shot; Delvin goes ahead and shakes each of their hands; CeeLo apologizes for missing out on him. The final artist of the night is James Wolpert loves computers and loved doing art; especially with computers but he fell in love with singing and wants to do it for a living. It was hard to put college on hold but believes The Voice is a great opportunity for him; he believes one on one time with any of the judges worth it. James is singing “Love Interruption”. CeeLo and Adam turn at the same time; then Blake joins them with Christina following behind him shortly after. Blake says he has so much character in his voice and it just dragged them all in, Blake says his favorite thing was seeing him and didn’t expect to see him like that. They all want him badly. Adam says he can win it for sure and CeeLo says it’s as if he’s been born for this. Christina would love to learn what inspired him and needs to be her coach. Jame chooses Adam to be his coach, Adam goes up and hugs him and is shocked he ever got him. Who Got Voted Off The Voice Tonight 11/27/12? Who Got Voted Off The Voice Tonight 5/14/13? Who Won The Voice Season 4 Tonight 6/18/13?